You probably have heard the term “Customer Avatar” before. But what does it mean and why is it important? WOW! Imagine knowing exactly the right words to say to a customer that will buy from you time and again and respond to your messages with the greatest positivity. A great lesson in business, targeting everyone will attract no one! When you reach to far and try to help anyone and everyone, the message gets watered down so much that no one will truly benefit. YOU NEED TO TARGET! I know what you are thinking… you are afraid of missing out on potential opportunities and yes that is a real fear that many have. But not every opportunity is a good one. I know that is a hard one to imagine but not everyone is a good fit to work with. Having a well-defined avatar will save you time and money and most definitely help your bottom line. That is why it is important! If you’re reading this list and realize you need help with your branding, you’re not alone. We’ve met lots of business owners like you who know their online presence isn’t what it should be, but aren’t sure where to start. That’s why we’ve created a powerful 2 hour FREE event called Your Brand Talks . . . But What is it Saying? to help you with your very own powerful online presence. 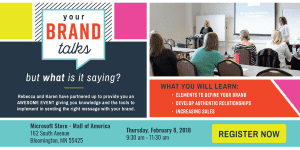 We’ll be covering how to attract the RIGHT customers and be seen for who you are, creating social credibility and maintain a consistent look and ways to generate more business opportunities via your website. As a savvy business owner, you know having an online presence is absolutely critical to your overall marketing strategy. For some, online business is the primary way clients find their way to your door. For others, an online presence makes selling products or goods possible. Either way, online marketing is important, and what’s more, it can be powerful. But the question becomes, how? How do you make your online presence pack a punch? How do you stand out in the sea of competition? And most importantly, what takes priority when it comes to branding? Below, we’ve put together our picks for five must-haves for a powerful online presence. Logos are the backbone of marketing, so it’s no wonder it makes the top of our list. However, what many businesses don’t realize about logo design is it needs to be flexible enough to suit a variety of needs. A logo shouldn’t be too complicated, but it should have different iterations depending on where it’s going to be used. Fonts are just as important as a logo when it comes to brand recognition. Using a specific set of fonts will bring cohesiveness to your marketing and make it easy for potential customers and clients to recognize you. It’s also important to choose fonts that aren’t difficult to read, which is especially important for large blocks of text. If you’re ever unsure of how impactful colors are, simply visit your local convenience or grocery store, walk down the aisle, and notice how generic products use the same color pallets as official brands. Why do this? Because every consumer knows Tide comes in a bright orange and blue jug. It’s easier to sell someone a product if there’s familiarity. Designers and artists go to classes specifically geared for understanding color and its applications. So if you want your brand to pack a punch, then you’ll need to consistently use the same colors. An “about” page might seem like a simple introduction, but it’s a lot more than that. Your “about” page is where a potential client learns about who you are, and more importantly, how you can help them. 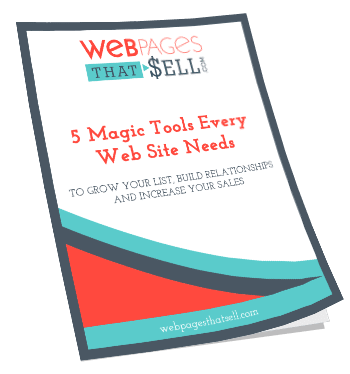 Every business owner brings a special “something” to the table, and your “about” page is a great place to show off what makes working with you so special. Maybe your “about” section tells your clients I’ve been where you are, or maybe it conveys your credentials in a way that’s approachable. However you decide to use your “about” page, keep in mind the type of impact you wish to make. When approaching branding, it’s worth keeping in mind who your target audience is and how best to speak to them. For instance, if your ideal client is women in business between the ages of 35-55, what language, colors and logo will appeal to them? Or if your market lies with millennials fresh out of college, how does your language change so you appear relevant and approachable?